Absolut Vodka was introduced in its present form in 1979, although its origins date back to 1879. Now it is the second best selling brand in the world among premium vodkas and the fourth largest brand among premium spirits. It is made from winter wheat grown in the south of Sweden using a unique method of continual distillation. This method was introduced in the 19th century by the king of vodkas, Lars Olsson Smith. Absolut Vodka is distilled over one hundred times. This ensures its perfect clarity, thus giving rise to its name – absolutely pure vodka. Aside from pure Absolut Vodka, there are numerous other variations you can enjoy made by mixing Absolute Vodka with natural flavors without added sugar. Presently there are 9 flavors: mango, black currant, mandarin orange, lemon, chili, grapefruit, pear, vanilla and raspberry. The Absolut Vodka line is rounded out by Absolut 100 in a black bottle. It is the only vodka which is 50 % alcohol, while the others are 40 %. 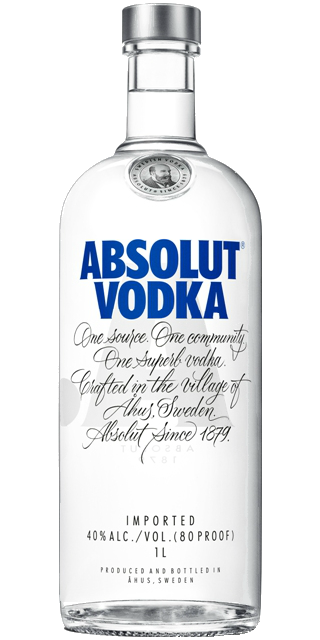 Absolut Vodka was introduced in its present form in 1979, although its origins date back to 1879. Now it is the second best selling brand in the world among premium vodkas and the fourth largest brand among premium spirits. It is made from winter wheat grown in the south of Sweden using a unique method of continual distillation. This method was introduced in the 19th century by the king of vodkas, Lars Olsson Smith. Absolut Vodka is distilled over one hundred times. This ensures its perfect clarity, thus giving rise to its name – absolutely pure vodka.